Zen Buddhist Monk Thích Nhất Hạnh was called to his path at the age of seven. Born in Vietnam in 1926, he has spent a lifetime actively working for peace in the world. Martin Luther King Jr. spoke out against the Vietnam War in 1965 under his guidance and nominated him for the Nobel Peace Prize. Known by many as Thầy, "teacher," Thích Nhất Hạnh started a global movement for Engaged Buddhism, connecting traditional meditative practice to active social engagement. Here are seven quotations to introduce you to his work and teachings. "We are here to awaken from the illusion of our separateness." Human beings are not separate from each other or Nature. We are totally interrelated and our actions have consequences to all. What we do to others we do to ourselves. What we do to the Earth we do to ourselves. "People have a hard time letting go of their suffering. Out of a fear of the unknown, they prefer suffering that is familiar." Rather than being with our suffering, many of us prefer to run from or bury what we have decided to be unpleasant. We can fall into patterns of suffering and the comfort of denial. 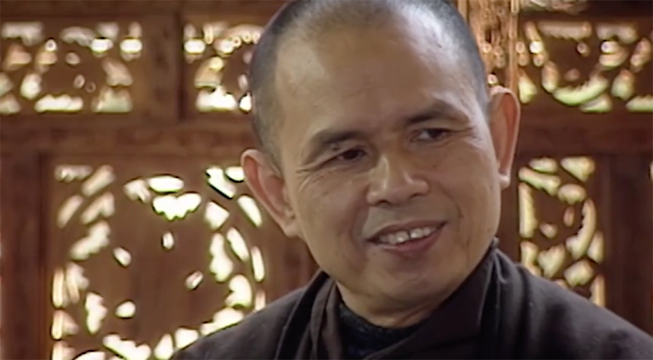 Thích Nhất Hạn's teachings expand the deep connection between suffering and happiness. The lotus flower, he says, cannot bloom from anywhere but the mud. If we do not know how to handle suffering, we cannot begin to handle happiness. Taking a deep look into the nature of suffering inside ourselves can help us understand the interrelated suffering of others and the suffering of the Earth. "Through my love for you, I want to express my love for the whole cosmos, the whole of humanity, and all beings. By living with you, I want to learn to love everyone and all species. If I succeed in loving you, I will be able to love everyone and all species on Earth... This is the real message of love." Thích Nhất Hạnh established Tiep Hien, the Order of Interbeing, in Saigon in 1966. The lotus and the mud cannot be without each other. They inter-are. We need the human and natural communities that sustain us. We are each other. To acknowledge the illusion of separation and let go of self is to inter-be. "For things to reveal themselves to us, we need to be ready to abandon our views about them." Wrong perception is always possible. Thích Nhất Hạnh teaches that wisdom can have much to do with letting go. In order to truly see something, we must shed our own bias and acknowledge the shifting nature of Truth. If we think we know something already, we undermine our own ability to learn. "We do not need to throw away anything, we need only to know how to transform one kind of energy into another." The energy of anger can be transformed into the energy of understanding. Thích Nhất Hạnh teaches us to hold our anger like a mother embraces her child. It can be nourished, like a flower, with the light of mindfulness to open itself into something new. We can interpret this teaching in a dual physical way, becoming more mindful of the physical law of conservation of energy, the idea that energy can be neither created nor destroyed. Meditating on this teaching can help us increase awareness of the food waste in landfills that could be reenergizing the earth as compost, or the energy we release as heat when we drive gas-burning vehicles. Rejecting waste from a place of spiritual reflection can help us do the same in our physical lives. The practice of compassion is an action. Merriam-Webster defines compassion as "sympathetic consciousness of others’ distress, together with a desire to alleviate it." These two parts are interdependent, they cannot be approached separately or passively. Actively listening and feeling deeply can incite powerful, meaningful action. "Our own life has to be our message." Thầy teaches the insight of impermanence, and the importance of its nourishment in our daily life. Acknowledging the fleeting nature of ourselves and all things can foster a deep grounding in the present moment and value for our place in a bigger picture. Join us for the Awakening the Dreamer program to hear about the new story emerging at this time in history—a story that recognizes, as Thích Nhất Hạnh does, how profoundly connected everyone and everything is. Take the course online or in person to join forces with like-minded people and stand powerfully for a new vision of the future.